Putin has given a remarkable address to the Federal Assembly, the Russian People, and the peoples of the world. 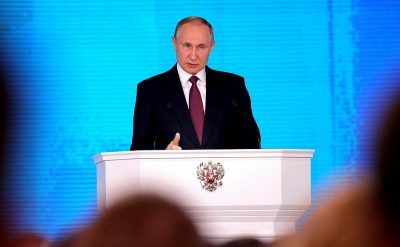 In his speech Putin revealed the existence of new Russian nuclear weapons that make it indisputably clear that Russia has vast nuclear superiority over the United States and its pathetic NATO vassal states. In view of the Russian capabilities, it is not clear that the US any longer qualifies as a superpower. There is little doubt in my mind that if the crazed neoconservatives and military/security complex in Washington had these weapons and Russia did not, Washington would launch an attack on Russia. Putin, however, declared that Russia has no territorial ambitions, no hegemonic ambitions, and no intention to attack any other country. Putin described the weapons as the necessary response to the West’s firm refusal year after year to accept peace and cooperation with Russia, instead surrounding Russia with military bases and ABM systems. So, what is to be done? Will the West come to its senses? Or will the West, drowning in debt and loaded to the gills with bloated and ineffective military industries, intensify the Cold War that Washington has resurrected? The Russian government concluded from years of frustrating experience with Washington’s refusal to consider Russia’s interests and to work together in a cooperative manner that the reason was Washington’s belief that American power could compel Russia to accept American leadership. To shatter this Washington illusion is the reason for Putin’s forceful announcement of the new Russian capabilities. I hope that Russian diplomacy succeeds in bringing an end to the rising tensions fomented by Washington. However, Russian diplomacy faces two perhaps insurmountable obstacles. One is the need for the bloated US military/security complex to have a major enemy as a justification for its $1,000 billion annual budget and the power that goes with it. The other obstacle is the neoconservative ideology of US world hegemony. The military/security complex is institutionalized in every US state. It is an employer and a source of major political campaign contributions, which makes it almost impossible for a senator or representative to go against its interests. In US foreign policy circles there is yet to appear countervailing power to the crazed neoconservatives. The Russiaphobia that the neoconservatives have created now affects ordinary Americans. These two obstacles have proved sufficiently powerful to prevent President Trump from normalizing relations with Russia. Perhaps in his next speech, Putin should address the Europeans directly and ask them how European interests are served by enabling Washington’s hostilities toward Russia. If push comes to shove, how can any country hosting US ABMs, US nuclear weapons, and US military bases expect to escape destruction? Without NATO and the forward bases it provides, Washington cannot drive the world to war. The basic fact of the matter is that NATO is an obstacle to peace.